The Antique Center of Red Bank is located in the beautiful historic district of the city. The buildings are air conidtioned in the summer months for your browsing pleasure. Travel in comfort from New York City, Newark and other points in northern New Jersey on the New Jersey North Coast Line to Red Bank Station. Once you depart the train, cross over the tracks and walk one block down Bridge Avenue to Front Street where Building III is located on the corner of Bridge and Front Street. 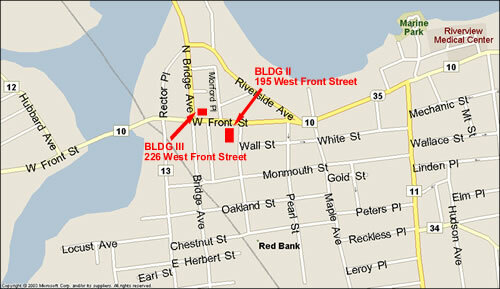 Building II is located on the opposite side of Front Street in the third building on the right side of Front Street. If you would like to travel by bus, visit New Jersey Transit Bus to check the schedule and determine the best route for coming to Red Bank. From The South: Take the Garden State Parkway North to exit 109. Go straight through the light onto Half Mile Road, turn right onto West Front Street and proceed to the third light. From The North: Take the Garden State Parkway South to exit 109. At the end of the exit ramp, turn left onto Route 520. Take the first jug handle onto Half Mile Road. At the end of Half Mile Road, turn right onto West Front Street. We are located at the third traffic light. Take NJ Turnpike to Exit 8 (Rt 33) Take either Route 537 or 33 into Freehold. Follow Rt. 537 to Colts Neck. Turn left onto Rt. 34. At the first light turn right onto Phalanx Rd. Follow Phalanx Rd. to Lincroft. Turn right onto Rt. 520 (Newman Springs Road) travel approximately 1 mile to the GS Parkway bridges. Take jughandle across Rt 520 onto Half Mile Road. Continue straight a head, at the end of Half Mile Road turn right onto West Front Street. We are located at the third traffic light. One story concrete building located on the south side of Front St, across from Brothers Italian restaurant.